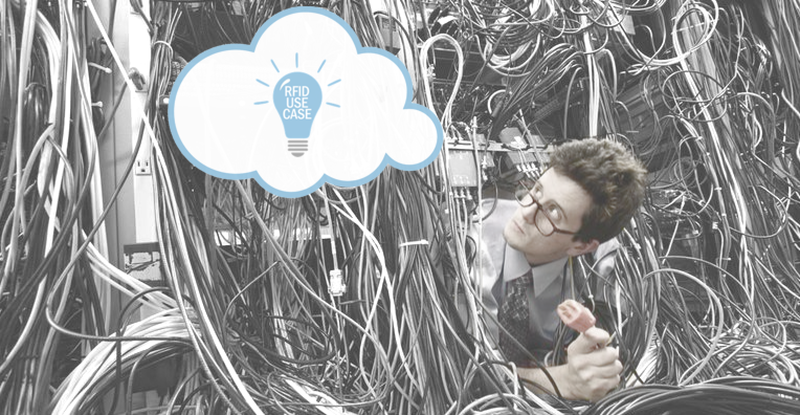 Have you ever stopped to think how your RFID use case would be better if it wasn’t wired to a plug in the wall or simpler if you didn’t have to worry about managing WiFi access? Have you noticed how deploying your production RFID solutions in the real world can get bogged down with infrastructure ‘gotchas’ and administrative red tape? We noticed too. That’s why we developed the award-winning SightWare® family of Untethered RFID™ readers. This blog post will review the many common constraints encountered by legacy RFID systems followed by an intro to Untethered RFID™ and how using cellular communications, ultra low-energy technology and the Cloud allow you to escape the confines of traditional readers. At the end of the post some illustrative examples and a summary of key benefits will be provided. Whether you’re an RFID newcomer or veteran creating a solution for a client, you always start by choosing a reader for your use case. If you’re considering a fixed reader, you assume you’ll need to connect to a local network or a desktop computer via Ethernet. If you have a handheld reader in mind, you assume you’ll need available WiFi hotspots. In both cases, you’ll definitely need to plug your reader (or a charging cradle) into an electrical outlet. These facility infrastructure requirements are the hidden Tethers of Legacy RFID. Often they are taken for granted, but in fact they can constrain your RFID use case from technical, operational and business perspectives. Not only do the above Tethers of Legacy RFID tie down your product development efforts and complicate return-on-investment (ROI), but they may prevent you from providing a solution to your customers in the first place. These issues constrain your business’s time, quality of service, capital and market reach. To break free from the constraints of the legacy fixed and handheld reader categories, Seeonic developed a family of readers called SightWare® that have disrupted the RFID industry. This new type of reader isn’t “fixed” because it isn’t tethered to a wall or local network, but it also isn’t a “handheld” because it isn’t tethered to a human. SightWare® is in a category of its own; one we call Untethered RFID™. Unlike local-area networks (LANs) that use Ethernet/WiFi, cellular is a wireless wide-area network (WAN) that is widely available due to universal demand for smartphone coverage. Cellular connectivity also sends data directly to the Cloud, allowing your RFID solution to bypass all traditional complexities that come with LANs. SightWare® has the RFID industry’s lowest energy consumption, allowing you to ditch power cables in place of batteries that last 2-5 years or solar/photonic sources that are fully self-sustainable. No power outlets are required (but you can still plug in SightWare® if you want). Untethered RFID™ has the capacity to enable use cases not possible before, breaking free of the constraints of legacy technologies and allowing for rapid deployments anywhere at scale. 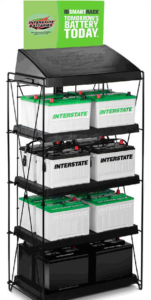 Interstate Batteries (IB) used SightWare® technology to create a family of RFID-enabled smart shelves called IBSmartRacks. IB has over 200,000 dealers — such as auto dealerships, repair garages, etc — each of which has a battery rack that needs to be stocked with a custom mix of products. Each rack was deployed by non-technical IB staff at dealers in both dense urban areas and very remote, rural areas across the nation. Because each deployment is in a different facility, it is impossible to know if electrical outlets are available, much less ethernet or WiFi networking. Because SightWare® is Untethered RFID™ and runs on batteries for 2-5 years while using the cellular network, IBSmartRack just works wherever it is placed. 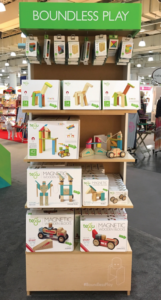 Tegu, a children’s toymaker, developed a groundbreaking technology-based consignment program called the Special Retail Initiative (SRI). This program was targeted at independent specialty retail stores nationwide. To scale the program rapidly and reliably, SightWare® Untethered RFID™ technology was integrated into branded Tegu fixtures. This “SmartFixture” automatically inventories all products nightly with high precision and communicates to Tegu headquarters using only battery power and the cellular network. No in-store electrical rewiring, no access to WiFi and no install technician was required, allowing toy store personnel to simply place the fixture wherever they wanted in their stores. Medtronic and Seeonic partnered to create the first RFID-enabled mobile medical device inventory bag. High-value medical devices are often carried by sales reps as “trunk stock” in their personal vehicles and then rolled in to hospitals for restocking or sales. 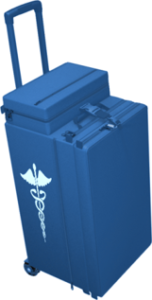 Using SightWare® battery power that lasts for years, medical sales reps can have their inventory tracked automatically simply by using their bag as normal. Because data goes directly to the cloud via the cellular network, sales reps can manage their inventory via smartphones and sales management can monitor remotely. Watts Bags, a leading supplier of medical inventory rolling bags, also used SightWare® Untethered RFID™ technology to create SmartBag that is marketed to various other medical device manufacturers and distributors. 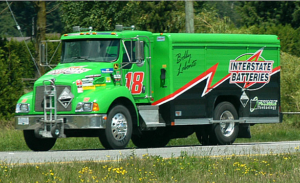 Interstate Batteries (IB) used SightWare® technology to enable the first RFID-enabled battery delivery vehicle, called IBSmartTruck. Hundreds of heavy automotive batteries can be transported on each truck, making manual counts and reconciliation time-consuming and often inaccurate. IBSmartTruck solved this by integrating co-developed technology into the chassis of the truck. A single SightWare® device lays at the center of every IBSmartTruck, intelligently using the vehicle’s battery in an ultra low-energy mode. Inventory and vehicle location can be tracked via cellular connectivity. In addition to the examples above, atlasRFIDstore published a great article on this topic: Enabling New Use Cases with Cellular RFID Readers. Escape the constraints of legacy products, reduce your development time, expand your market reach and deploy use cases not possible before with SightWare®. To view the complete line of Untethered RFID™ products, dev kits and accessories, please visit the Seeonic page at atlasRFIDstore. SightWare® technologies have been industry-recognized in several award categories, including Best Implementation (2015), Best Retail Implementation (2016) and Best Product (2018).